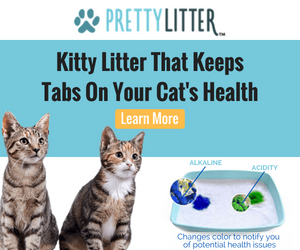 Pretty Litter is a revolutionary new cat litter. It changes color so you can keep tabs on your cat's health. Blue and green could indicate a urinary tract infection, whereas, orange and yellow could indicate acidity. No more lugging heavy cat litter home from the store. You can get a month's supply delivered to your door each month and shipping is free! Plus, use code: AFF10 to save 10% off your order. If you're feeling lucky, spin the savings wheel on their website and see if you can save even more!